Most old home computers used digital joysticks similar to the joysticks used in Atari 2600 video game. 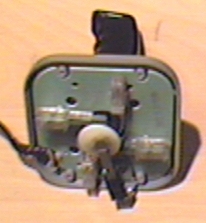 This 9 pin joystick interface became a de-facto standard in early home computer industry. Because of that, a single joystick could be used without hassle on Atari (130, 800XE, 800XL, 2600, 7200), Amiga, Commodore C64, Amstrad CPC, Sinclair ZX Spectrum and many other machines. That's why these joysticks are sometimes called "Multisystem". For example Commodore VIC20 and Commodore 64 computers supported those paddle controllers. There are many ways to contruct a digital joystick. Some of the cheapest joystick just have mechanics of cheap buttons, where the better ones usually utilize microswitches. On the picture below you can see WICO Boss joystick construction. It uses five switches which are built from two springs which touch each other when stick is moved or button is pressed. There is a picture of original Atari 2600 stick and what's inside it available on the web at http://www.netaxis.com/~petebuilt/videogames/26insid.html.